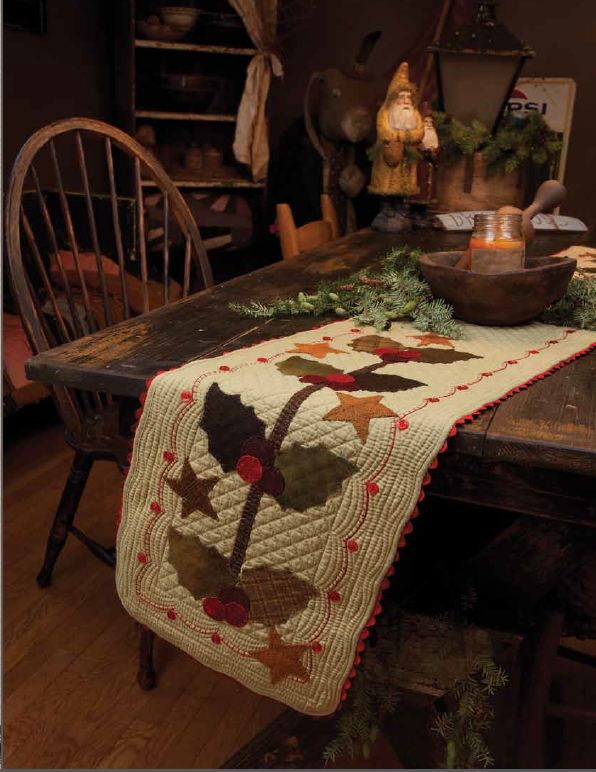 Primitive Quilts and Projects - new issue should be arriving to you (or your local quilt shop) SOON!! It's hot off the press..... Isn't the cover beautiful? It's a gorgeous quilt from my friend, Lynne Hagmeier - Kansas Trouble Quilts. Here if my project - Holly Table Runner !! It's 12" x 72" long... this photo just shows a portion of the table runner. This same design is at the other end of the table runner. The best thing of this whole design???? The table runner is pre-quilted for you! You'll add the wool, red buttonhole stitching in the scalloped border, buttons and rick-rack binding. Kits are available($65.00) and your pattern is in the magazine! Get your issue NOW!!! Go to Primitive Quilts and Projects Magazine and get your subscription!! 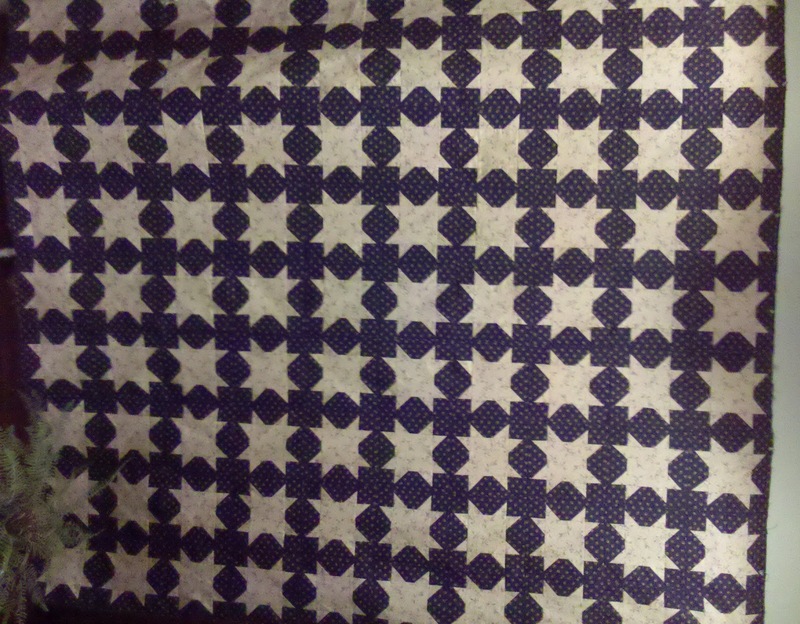 A couple of postings back I told you about the quilt I was designing using Paula Barnes new fabric line by Marcus Brothers - Tavern Blues... remember? Well, here is the quilt before it was delivered to my long-arm queens, "Lynn & Cathy" !! We've named it - "Tavern Stars" !!! These stars are the BEST to make - you'll NEVER loose your points!! TRUST ME!!!! The quilt has it's binding finished and has been mailed to Marcus Brothers Fabric where it will be on display in their booth at the Houston Quilt Market! The pattern will be available to purchase from my website by the end of November. My AWESOME graphic designer - LISA - also does tons of work for MODA and she's swamped right now... helping them to get ready for market also. So she'll work on my pattern after we return from Houston (end of this month). When she's finished - it will be shipped to my printer... then I'll get it posted on the website Olde Green Cupboard Designs ASAP! The great thing about this pattern....it has NO BORDERS - so if you need it larger or smaller - simply make more or less stars!! Your choice!! Now... here is a beauty that I've just finished !!! My friend, Karen Covey, is the owner of Cinnamon's Quilt Shoppe here in Jacksonville. It just celebrated it's one year anniversary..
Karen LOVES wool (a girl after my own heart)!!! She asked if I would make this wonderful quilt (designed by Lisa Bongean - Primitive Gatherings Quilt Shop) for the shop. More information will be announced at a later date by Lisa... of which I will pass on to all of you. However.... I can tell you this project will be a Block-of-the-Week that will begin this upcoming spring! It will run for 16 weeks where you will receive ONE flower block per week. A separate finishing kit will be part of the sign-up package! These flowers are simple shapes to buttonhole stitch - easy and fast! If you've always wanted to learn this technique - now is your chance. I'll keep you posted on the details as they are available....!!!! Well...it's now time to get busy and get something done today! Heck... I'm still in my 'jammies!!! The weather is cool, sunny and GORGEOUS!!! I think it's a perfect day to open all the windows and smell that cool fresh air... AND SEW!!!! Be kind and have a super day! !